Tulsidasji has made a mention of the Ramrasayan held by Hanuman in the choupai (four-lined verse) in Hanuman Chalisa. Sadguru Shree Aniruddha has explained the importance of the Ramnaam, which can be easily chanted, and the Ram Katha (story of Shree Ram) many a time through his discourses. Which simply means that there is absolutely no place for perils, where the Ram Katha is recited. The influence of such perils over us becomes negligible. The ‘Shree Ramrasayan’, authored by Sadguru Shree Aniruddha (Bapu) illustrates how it is a ‘Rasayan’ (mystique or acts as a resolve) of the ‘Ramnaam’. Rasayana is a substance that, rectifies the imbalance in the tridosha (the three basic states – Kapha, Vaata, Pitta) of the body and eliminates the effects occurring due to maladies or old age. Rasayana is a remedy that grants an optimized capacity and course to every faculty and organ of the body, for the performance of their assigned functions. Ramrasayan also means always assuming the role of a servitor of Shree Ram. Therefore, the Rasayan that acts on the trividha deha (the three levels of existence of the body viz., the physical, the intellectual and the spiritual, is the Ramrasayan. Ramrasayan is a synopsis of the life story of Shree Ram from the Ram Katha right from his birth till the establishment of the Ramarajya. The pictures in this grantha depict the situation in each story well. Ravana symbolises the ill-fate and demonic (tamasi) ego, which generates fear in an individual’s life. Ravan, who signifies ill-fate separates Mother Janaki, representing peace and contentment from Ram, who is symbolic of Purushartha (signifies the object of the human pursuit). The defeat of Ravan, whose life force is the ego and whose intellect comprises of the six foes of man (Shandripu) such as Kaam (Desire), Krodh (Wrath), Moha (Temptation), occurs only at the hands of Shree Ram. The ill-fate and evil tendencies, which haunt humans are always destroyed. This becomes possible only when an individual becomes a vanar soldier of Shree Ram. Bapu has explained it very beautifully in the grantha of Ramrasayan. Every character in the grantha is brought to life as we read it. Just as the Ramnaam causes the rocks to float on water effortlessly, every Shraddhavan develops the firm faith that it would similarly also save their lives. The varied characters from the Ramayana portrayed in the grantha makes each one aware of the different facets of their lives. The grantha helps us recognize the Ravan-like vices present in our lives and shows us a simple yet spiritual path to bring about apt changes in our life. The grantha of Ramrasayan, which is authored by Sadguru Shree Aniruddha is not just the life story of Shree Ram, but the very code of conduct to live our life with verve, liveliness and positivity. Performing the selfless Seva of the supreme Shree Ram is the highest purpose of every human being’s life and is the very crux (soul) of the Ramrasayan grantha. 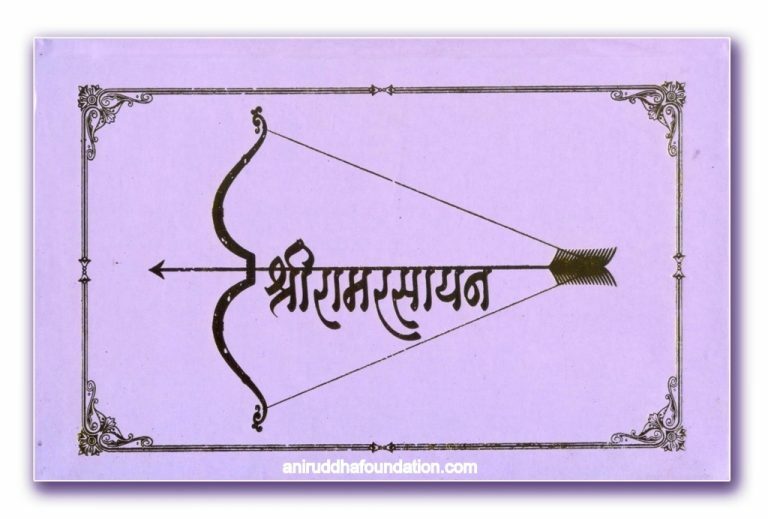 Sadguru Shree Aniruddha has opened for Shraddhavans the synopsis of a grantha as sacred and monumental as the Ramayan, in a beautiful, simple, clean Marathi language and illustrated with pictures, presented in the form of the Ramrasayan grantha. Shraddhavans regularly and affectionately perform the recital of the grantha. They also perform the recital of the grantha at Shree Aniruddha Gurukshetram, throughout the night for raatra pathan. Also, as per the guidance of Sadguru Shree Aniruddha, Shraddhavans perform the recital of Shree Hanuman Chalisa and Sunderkand which contains the characterisation of Shree Hanuman, the one who truly possesses the Ramarasayan.